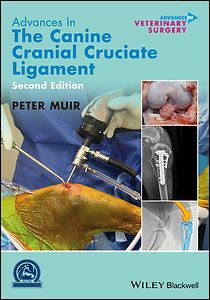 Advances in the Canine Cranial Cruciate Ligament, Second Edition updates the seminal work on cruciate ligament rupture in dogs. Presenting six brand-new chapters and completely updated information throughout, the book summarizes current knowledge on this important condition and points to future development in the area for study and practice. Edited by a leading clinician scientist in the field and contributed to by experts in a variety of areas, the book is a state-of-the-art, multidisciplinary reference. Encompassing all aspects of the canine cranial cruciate ligament, including its structure and function, etiopathogenesis, clinical features, surgical treatment, and medical management, the book provides the information necessary to accurately diagnose, treat, and manage cruciate ligament rupture cases. It also includes an innovative section that examines possible future advances in diagnostics and treatment options.